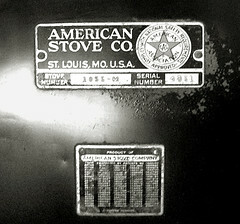 American Stove Company -- sign plate. Metal plates on the back of a Magic Chef natural gas stove, including stove number and serial number. With respect to manufacturing, the plate refers solely to the "American Stove Company" rather than "Magic Chef." we have an american stove company Magic chef stove. we are looking to get more information regarding this antique in regards to the value of it. it is in good condition and still works perfectly. if have any information that may help us please respond. I'm not an expert on stoves, but have been doing a fair bit of research on them recently. My research has been more related to the progression of designs, influences, and their importance in the product line of Magic Chef / American Stove Company. I would be able to put you in touch with some good sources for information if you write me at my email address ALWRaimist [at] me [dot] com (insert appropriate symbols where brackets are indicated). Please provide your name, location, email address and other contact information. I'll do my best to steer you in the right direction.